The circumstances around the election of FIDE President encourage me to address my colleagues with this letter. I have always called interested federations and FIDE authorities for paying attention to the urgent need for reforms in FIDE management and transparent interaction with sponsors and companies that would like to cooperate with FIDE on a mutually beneficial basis. Unfortunately, the former FIDE President Kirsan Ilyumzhinov categorically rejected any attempts to modernize FIDE management and decision-making system, and interaction with the external structures remained on the President’s sole discretion. Attempts to limit the possibility to run the Presidential election for two times were also unsuccessful. All these circumstances could not but lead to stagnation and crisis inside of the Federation. At the same time, I believe that the suspension of Mr. Ilyumzhinov and the election of a new President give chance to change this situation, especially if constructive and pragmatic forces unite to prevent the continuation of the disastrous policy pursued by Mr. Ilyumzhinov for a long period. However, apparently, one of the contenders for the post of President, Mr. Dvorkovich is going to proceed with the same destructive policy. Numerous reports indicate that Mr. Ilyumzhinov’s team, which has been placed at Mr. Dvorkovich’s disposal, intends to use the same methods of conducting the election campaign that have been used repeatedly in the past, namely, involving Russian state structures, embassies and other institutions to promote Mr. Dvorkovich’s candidacy and “persuading” the Federations in need to vote for Mr. Dvorkovich. Probably, in the process of this “persuasion” the same methods, tested by Russian “persuasion experts” in many other cases, in particular when interacting with FIFA, will be used. Let me remind you that most of the former FIFA leadership, who has been imprudently responsive to Moscow proposals, are in prison now, under criminal prosecution, sanctions or have been shamefully resigned. 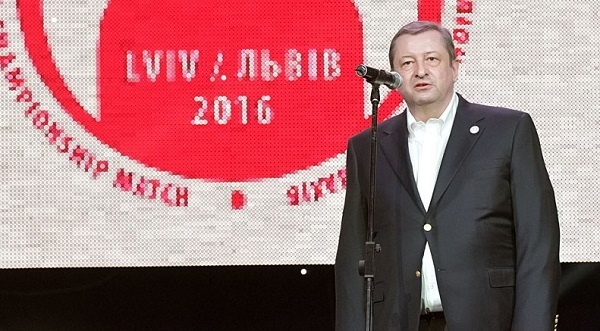 The fact that the Kremlin is behind the candidacy of Mr. Dvorkovich and his team is not doubtful. There are numerous facts proving the attempts to bribe and pressure from Mr. Dvorkovich and his associates, as well as state and non-state structures of Russia, to guide a number of federations. The invitation of the leaders of some federations to the matches of the World Cup (with expenses paid of course), the announcement that charter flights will be organized for the transportation of delegates to the General Assembly in Batumi and the promises of certain business proposals to chess federation presidents or delegates – what are all these, if not direct bribery. Furthermore, President Putin’s direct appeal to the Prime Minister of Israel Netanyahu with the request to support the candidacy of Mr. Dvorkovich by the Israeli federation, and his offer to give as an exchange support for the organization of a sports event, should be considered as a “favor for a favor” and as the height of pressure and interference in the affairs of the independent FIDE. Needless to say, such actions are against the principles of electoral integrity which any sports organization recognized by IOC should stick to, including FIDE. It is possible to say with certainty that if Mr. Dvorkovich is elected, FIDE would become a kind of corporation where Putin’s Russia will be the main shareholder, and FIDE President elections will turn into fiction for many decades, as happened with the presidential elections in Russia itself. I wish also to remind you that Mr. Dvorkovich himself has been included in the pre-Sanctions List of the US Treasury, published on January 30, 2018, which means that sanctions against him can be activated at any moment. It is definitely not in favor of the world chess. Some of our colleagues nominated Nigel Short for the President of FIDE. I respect their choice. However, in the current situation, I would like to draw your attention to the following circumstances. Grandmaster Short and the team behind him are respected by the chess community. At the same time, the reality is that Mr. Short cannot count on victory in this electoral cycle. I am sure that even the most loyal of his supporters would agree with this. Objectively, the participation of Grandmaster Short in the elections works in favor of Mr. Dvorkovich and nourishes his hopes to win elections and continue the policy of his predecessor only in a more pro-Kremlin orientation. I also realize that the candidacy of acting FIDE President Mr. Georgios Makropoulos causes a mixed reaction among some of our colleagues, including Short’s team. However, considering current circumstances and being a realist, I have to state that only Mr. Makropoulos is able to defend FIDE’s independence and resist the attempt of Russia to absorb the Federation. Addressing my colleagues, I call for the proactive and healthy forces of FIDE and Federations to unite in order to protect the ideals and values of FIDE. I am sure that there are no issues that can be unsolved if there is a good will and that now is the moment when tactical differences should be subordinated to the achievement of a common strategic goal. I highly appreciate your time and attention. July 26: Arkady Dvorkovich in the pre-sanctions list of the US Treasury: New problems for FIDE? May 5: Virtual candidate on Kirsan Ilyumzhinov’s ticket?